465 pages | 248 B/W Illus. Developed in conjunction with several oil companies using experimental data for real reservoir fluids, Phase Behavior of Petroleum Reservoir Fluids introduces industry standard methods for modeling the phase behavior of petroleum reservoir fluids at different stages in the process. Keeping mathematics to a minimum, this book discusses sampling, characterization, compositional analyses, and equations of state used to simulate various pressure–volume–temperature (PVT) properties of reservoir fluids. 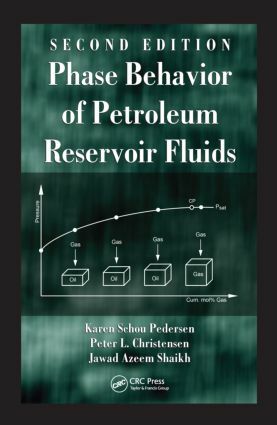 Phase Behavior of Petroleum Reservoir Fluids, Second Edition supplies a solid understanding of the phase behavior of the various fluids present in a petroleum reservoir, providing practical knowledge essential for achieving optimal design and cost-effective operations in a petroleum processing plant. "This book offers a very good balance between experiment and theory and is written in a style … that is practical and easy to comprehend. The chapters on organic and inorganic solid deposition will be of great use for professionals that are involved in flow assurance. … The approach taken by the authors is very logical, i.e., starting with the basics of petroleum chemistry to scale deposition covering all aspects of petroleum reservoir fluids that one needs to know. Enhanced experimental procedures and analysis of EOR PVT data are great new additions to the Second Edition. … Karen and co-authors, with their rich experience and expertise, are perhaps some of the most authoritative and widely recognized professionals in the area of petroleum reservoir fluids, and a book written by them on what they practice is the best thing one can ask for. Therefore, reservoir engineers in industry as well as those in academia will benefit immensely from this book." "The big advantage of this book for me is that it has a dedicated chapter covering fluid sampling, sample quality control, and compositional analysis. The description of the way reservoir fluid composition is derived from the compositions of individual sub-samples is especially useful, as I am not aware of it being covered in such detail in other texts. … The book contents give very good coverage of a broad range of phase behavior concepts. … It is refreshing to see sampling techniques covered in good detail." Karen Schou Pedersen holds a Ph.D in liquid physics from the Department of Physical Chemistry at the Technical University of Denmark. She has worked as a research associate at the Physics Department at Edinburgh University and at the nuclear research center, Institut Laue-Langevin, in Grenoble. She has been the managing director of Calsep A/S since 1984 and has been responsible for several R & D projects within reservoir fluid modeling and flow assurance. She is the author of more than 50 publications on oil and gas properties. Peter L. Christensen holds a Ph.D from the Department of Chemical Engineering at the Technical University of Denmark. He started his career in oil and gas technology at Risø National Laboratories in Denmark focusing on studies in the fields of reservoir simulation and PVT. He has been an associate professor at the Technical University of Denmark and lectured in thermodynamics, unit operations, and oil and gas technology. He is currently a senior principal consultant at Calsep A/S. Jawad Azeem Shaikh holds an M.Sc in petroleum technology from the University of Pune in India. He has been the regional manager and principal consultant of Calsep FZ-LLC in Dubai since 2009 and has been responsible for the project including lab coordination, designing of enhanced oil recovery studies, and equation of state modeling work of oil and gas properties. Before joining Calsep, he was an advanced studies supervisor for Core Laboratories International B.V. He has authored several papers and articles on sampling, PVT lab work, and oil and gas properties.